While bigger is a clear sign of business success, it could very well be the sword of Damocles for most of fast food giants. Imagine allowing several people to use your name and live your persona in several parts of the world, you’ll probably be worried as hell that someone will foul up somewhere and you’ll just likely to receive a call for your warrant of arrest. The same is the case with the fast food giants who have allowed so many franchises all over the world. Someone is bound to foul up and ruin the name they have established. So what, if it brings more profit. That’s the problem with corporations, as most of the fast food chains already are, it has a distinct juridical personality that survives independently from its owners. When a corporation fouls up, the owners can put their minds at ease because it’s not them, it’s somebody else named McDonald’s, Wendy’s or Burger King who is nothing but paper. Corporate directors and board members will enjoy the profit on dividends day and will just rely on lawyers, spokesmen and branch managers to face the public in complaint cases and scandals, and there have already been so many. Yum Brands who owns the McDonald’s and KFC franchises in China tainted the McDonald’s name not only in the region but the entire world when TV reports showed burger workers in their meat supplier picking up meat from the factory floor and mixing expired meat with the new meat. Would Yum Brands have done what they did of changing suppliers if the incident didn’t have the media exposure? Are we sure that Yum Brands didn’t know about this and could be one of the things that go along with a very nice supplier’s price? If they didn’t know about it, how come media got their hands on the info ahead of them? How closely are they monitoring their suppliers? Or, is there any kind of supervision or inspection at all? Last question is; who is Yum Brands? That’s right; Yum Brands is nothing but a business name written on piece of paper with a registry stamp from the local institution handling the trade and businesses department. It’s just McDonald’s who stands to lose in this 2012 scandal. Yum Brands can just dissolve after all the assets have been distributed to the directors and members and , disappear forever without having to face any lawsuit just like a deceased person who is no longer liable for the faults he made in his lifetime. Meanwhile McDonald’s is still around and will have to live on with this scar in its long and fruitful history. The worst thing about it is that the very same people at Yum corporation can just put up another corporation with different name and do the same thing all over again with either McDonald’s, in case they never learn, or any other fast food giant. Expanding and giving away that franchise too easy is like increasing the height of the mountain where you can fall off from and increasing the gusts of wind that can push you over. While the race to more locations is more competitive than ever, maintaining the untainted name will be the anchor that should keep them from being too aggressive at the point of being careless. Is it because, these franchising and expansion executives have no emotional attachment to the business name? Maybe these fast food giants should capitalize on nepotism so that these overly aggressive execs would start thinking about the real future of the company in behalf of their kids who may a chance of enjoying priority of entry in the company. The original business owner of any fast food chain would do the same thing for the company’s future is directly related to their kids’ future. At the level where most of these fast food giants are competing in, making money is no longer the issue it’s all about making the most money because success is no longer measured to prior year’s results. Success is determined by who’s number 1. And the top slot is reserved for the one that’s most popular in terms of locations. The original owner of Burger King has the least to worry about because it’s not a personal name. The McDonalds clan will have to live their lives with whatever glory or scandal the 34,492 McDonald’s outlets in the world make. 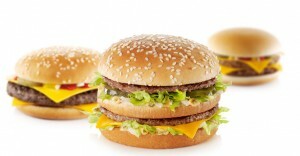 Everyone in China will remember the name McDonald whenever they recall that issue with Yum brands. Richard and Maurice McDonald’s grandchildren will have to put up with all these and the rest to come.